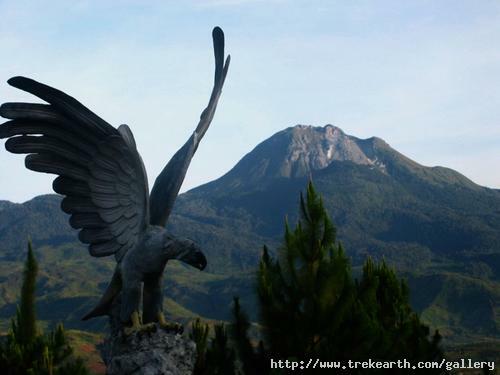 Mount Apo is a large stratovolcano on the island of Mindanao in the Philippines. It is the highest mountain in the country and overlooks Davao City, a few kilometres to the northeast. Its name means "master" or "grandfather". Apo is flat topped, with three peaks, and is capped by a 500 m wide volcanic crater containing a small crater lake. It is a source of geothermal energy, but the date of its most recent eruption is unknown, and none are verified in historic times. Mount Apo is one of the most popular climbing destinations in the Philippines, and the summit is easy to reach. It was first climbed on October 10, 1880 by a party led by Don Joaquin Rajal. Prior to your climb, it is advisable to check first thru the local tourism office of any advisory prohibiting the use of certain route to the peak. Best time to travel is early morning. Best month to climb is during summer before the Holy Week, to avoid too many people crowding at the peak. At Davao City take a taxi to Ecoland Bus Terminal, find a Digos bound bus. While in Digos, Davao del Sur, ask direction for Kapatagan terminal, there you can choose to ride public van transport or (if you're daring) the "Habal-habal" or motorcycle transport. Once you're in Kapatagan, find a ride going to Sitio Marawer, be it on a motorcycle, horseback or passenger jeeps. It's wise to pay a visit to the Barangay officials there, they can help if ever you'll need reliable porters or guides. A 4x4 vehicle if available can bring you higher to Mainit otherwise you'll have to start hiking from Marawer. You can camp at Goddy-goddy on the first night. The next day find you in the open, scaling the big boulders going up to the steaming sulfur section of the volcano. Camp the 2nd night at the peak, early on the 3rd day explore the several small peaks within the summit, the sky is usually clear at this time of the day. It takes about 2-3 hours trekking down to Lake Venado from the peak where you can setup your tent for the night or proceed down Marble River or Agco.